This Amish Pine Hutch offers open storage in the hutch top to display your pottery or china as well as plenty of space for serving during meals on the sideboard. Place this pine hutch in the dining room at the end of the dining table or in the kitchen for extra storage. The roomy drawers are the perfect place to store your flatware and serving utensils as well as linens for the table. Pair this hutch with our Amish Made Farmhouse Kitchen Table to complete the look in your dining room or kitchen. DutchCrafters Amish handcrafted hutch features kiln dried solid Eastern White Pine Construction with your choice of a stained, painted or two tone finish. We also offer glazing and distressing to bring an Old World look to your new hutch. This Sideboard with Hutch is styled after French Farmhouse Hutches with the open design. This is bench made to order for each customer which allows you to customize it into a pine stained hutch or into a cottage looking painted hutch. Cottage furniture and paint furniture is a style that remains very popular in many parts of the United States and Europe. Call to order stain or paint samples to match to existing furniture or help you decide between colors. If you have decided on this piece of Amish furniture but not the finish then select to be determined for the finish and we will send you out samples upon ordering. 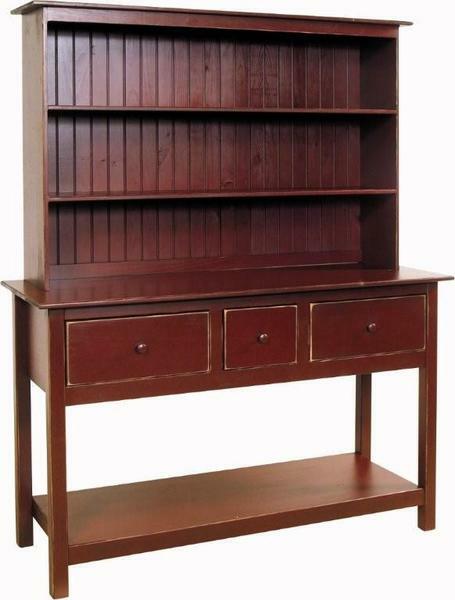 Our Amish Pine Jumbo Hutch is also called a Sideboard Hutch, Sideboard with Hutch or Buffet with Hutch top. This Amish furniture is proudly made in the USA in the heartland of Pennsylvania. Call 1-866-272-6773 to speak to a design specialists or visit them at our Amish furniture store in Sarasota, Florida. Height From Ground to the Bottom of the Bottom Shelf: 4 1/4"
Actual Bottom Shelf Thickness: 3/4"
Bottom Shelf Thickness with Front Shelf Trim: 2 3/4"
Bottom Shelf to Height to Under the Drawers 19"
Amish Construction from kiln dried pine wood. NO veneers or particle board are used in the construction of our pine wood furniture.